"Balm mint" redirects here. For the balm mint bush, see Prostanthera melissifolia. Lemon balm (Melissa officinalis), balm, common balm, or balm mint, is a perennial herbaceous plant in the mint family Lamiaceae and native to south-central Europe, Iran, and Central Asia, but now naturalized in the Americas and elsewhere. M. officinalis is native to Europe, central Asia and Iran, but is now naturalized around the world. M. officinalis may be the "honey-leaf" (μελισσόφυλλον) mentioned by Theophrastus. It was in the herbal garden of John Gerard, 1596. As of 1992 the major producing countries were Hungary, Egypt, Italy, for herb Ireland for essential oil. The composition and pharmacology and potential uses of lemon balm have been extensively studied, especially with regard to its traditional uses. Randomized, double-blinded clinical studies in people, however, have been limited and have had few subjects. Those studies cannot be used for generalized conclusions about the safety or efficacy of lemon balm and its components; what doses are safe and effective is especially not clear. 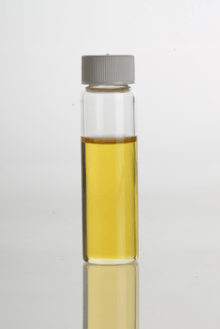 Lemon balm contains eugenol, tannins, and terpenes. It also contains 1-octen-3-ol, 10-alpha-cadinol, 3-octanol, 3-octanone, alpha-cubebene, alpha-humulene, beta-bourbonene, caffeic acid, caryophyllene, caryophyllene oxide, catechinene, chlorogenic acid, cis-3-hexenol, cis-ocimene, citral A, citral B, citronellal, copaene, delta-cadinene, eugenyl acetate, gamma-cadinene, geranial, geraniol, geranyl acetate, germacrene D, isogeranial, linalool, luteolin-7-glucoside, methylheptenone, neral, nerol, octyl benzoate, oleanolic acid, pomolic acid, protocatechuic acid, rhamnazine, rosmarinic acid, rosmarinin acid, stachyose, succinic acid, thymol, trans-ocimene and ursolic acid. 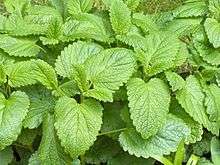 Lemon balm may contain traces of harmine. Rosmarinic acid appears to be the most important active component, but the interaction of chemicals within lemon balm, and with chemicals in other herbs with which it has been commonly used in traditional medicines, is poorly understood. ↑ "Lemon balm". University of Maryland Medical Center. Apr 5, 2011. Retrieved Oct 18, 2014. ↑ Chisholm, Hugh, ed. (1911). "Balm". Encyclopædia Britannica. 3 (11th ed.). Cambridge University Press. ↑ "Melissa officinalis". Natural Resources Conservation Service PLANTS Database. USDA. Retrieved 6 July 2015. 1 2 "Taxon: Melissa officinalis L.". USDA: U.S. National Plant Germplasm System. Retrieved 8 October 2016. ↑ Vogl, S; Picker, P; Mihaly-Bison, J; Fakhrudin, N; Atanasov, AG; Heiss, EH; Wawrosch, C; Reznicek, G; et al. (2013). "Ethnopharmacological in vitro studies on Austria's folk medicine-An unexplored lore in vitro anti-inflammatory activities of 71 Austrian traditional herbal drugs". Journal of Ethnopharmacology. 149 (3): 750–71. doi:10.1016/j.jep.2013.06.007. PMC 3791396 . PMID 23770053. ↑ Hiller, Sabine (September 6, 2010). "FOOD Using lemon balm in the kitchen". The Mayo News. Retrieved May 2, 2012. ↑ "Monograph: Lemon Balm". Health Canada. 17 March 2008. Retrieved 8 October 2016. ↑ Masters, Susanne (22 February 2013). "The benefits of lemon balm". The Guardian. ↑ Axtell, B.L. ; Fairman, R.M (1992). "Melissa officinalis". Minor oil crops. Rome: Food and Agriculture Organization of the United Nations. ISBN 92-5-103128-2. 1 2 3 Shakeri, A; Sahebkar, A; Javadi, B (21 July 2016). 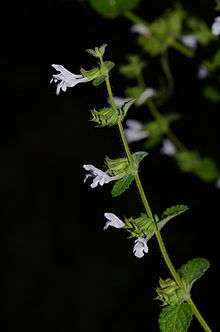 "Melissa officinalis L. - A review of its traditional uses, phytochemistry and pharmacology.". Journal of ethnopharmacology. 188: 204–28. PMID 27167460. ↑ "Lemon balm | University of Maryland Medical Center". Retrieved 24 December 2013. ↑ "Melissa officinalis | Featured Extracts". Retrieved 24 December 2013. ↑ Natalie Harrington (2012). "Harmala Alkaloids as Bee Signaling Chemicals". Journal of Student Research. 1 (1): 23–32.